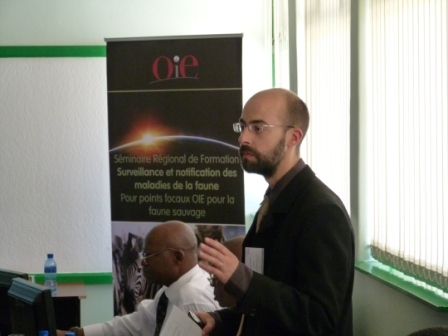 Dr. Sylvain Larrat represented the CCWHC at a World Organization for Animal Health (OIE) workshop in December 2011. We are pleased to announce that Dr. Sylvain Larrat has successfully completed a 3 years residency training program in wildlife health management offered by the CCWHC – Quebec. The objective of this specialized program is to train veterinarians in the field of wild animal pathology, epidemiology and medicine. During these 3 years Dr. Larrat was involved in all aspects of the work conducted at the CCWHC Québec regional center. Dr. Larrat also had the opportunity to work as a clinical veterinarian for the Quebec Aquarium and the Provincial Raptor Rehabilitation Center, and participate on different field projects. Dr. Larrat is the second resident completing this unique training program. The first resident, Dr. Guylaine Séguin, is currently working as wildlife veterinarian for the Ministère des Ressources naturelles et de la Faune du Québec. Dr. Larrat is currently completing a MSc degree at the Université de Montréal, looking at morphometric data of beluga whale carcasses. I am no one, I guess that is what happens when you retire… But I have had the unique, and an occasion to witness, speak to, and have a diagnosis of a particular animal which was in the very good care of DR. Sylvain Larrat,, at the Hôpital Vétérinaire de St-Hyacinthe… not so long ago.. I feel I was EXCEPTIONNALLY fortunate,, because he truly is … and should be kept as one of ours.. I regret he is leaving Québec.. but somehow,, I am convinced he will return,, because without him actually saying so … I could sense he belonged.. here with us,, in Québec.. Many thanks to you, for having posted such a message, making it possible for me to express my gratitude..
and I remain, a grateful friend,,,, for he is a devoted and a heartfelt compassionate vet..
Next story The Series Of Peripartum Mortalities Continue in Female St. Lawrence Beluga Whales.